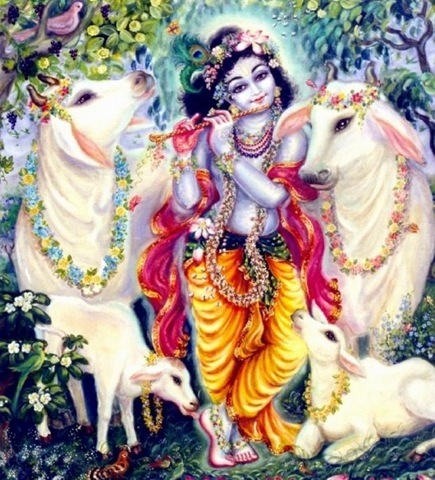 Lord Krishna is also known as Gopala, or protector of the cows. 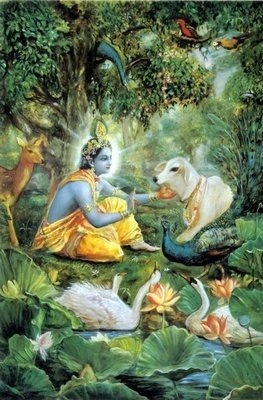 His love for and relationship with the cows of Vrindavan forms a major part of His transcendental past times. Among the artwork depicting His holy image, there are just as many showing Him with His beloved cows as there are images depicting Him with His beloved Radha and the gopis. 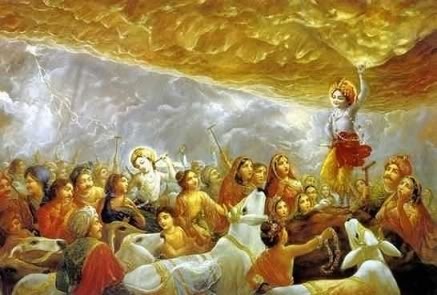 As Giridhara, He lifted the mountain of Govardhana to protect the citizens and the cows from destruction. When He played His flute, the cows were there, His most ardent audience. When He wanted to eat, the cows were there, His most willing suppliers of milk and butter. When He wanted affection, the cows were there, His most unselfish companions, wanting nothing from Him but His caress and His embrace, which they freely returned. And so, it is not surprising that from these stories and for other reasons, the practice of offering Him prasadam made with dairy, and bathing His image in milk developed and took hold as the cornerstone of devotional rituals. At abishekam, a devotional service, the offering of milk is one of the most common items donated by devotees. Sometimes mixed with honey and other items, the milk is poured onto the deity and flows freely and amply throughout the ritual, allowed to drain into metal bowls, collected and then poured back into the bottles for the devotees to take home, now blessed by the Lord. A small vessel is also passed around the room, with each of us given a small spoonful to drink the blessings of Divinity. Food is also offered to the Lord for prasadam and usually contains milk and ghee, a form of clarified butter. After the puja is complete, the food is shared by devotees partaking of the Lord’s blessings, gathering together in the sangha of God’s worship. What appears as a charming expression of devotion now has lurking behind it a vile abuse of this most sacred creature of the Lord, both in India and here in America, knowingly perpetrated by the suppliers of the dairy products and unwittingly financed by the Lord’s devotees. While I converted to a vegetarian diet years ago, I continued to include some dairy in my diet, although very limited due to my developing concern with ahimsa and allergic skin reactions. But I continued to accept the prasad, I continued to pour the milk when the occasion arose and I relished the sweets and the wonderful Indian cuisine so freely shared where I worship. I told myself that any hesitations I had should be quashed within myself because these were offerings to God and had been blessed and cleansed of any sins committed in their procurement. Lately, though, I was becoming uneasy about it, but not voicing my thoughts and not knowing quite how to voice my developing uncertainty over the source of these offerings. “….as devotees of Lord Sri Krishna we must definitely pay attention to the plight of His most beloved animal, the Cow (Go-mata). Just recently on Sri Krishna Jayanthi, we bathed Lord Sri Krishna in milk, curd, ghee and offered Him His favourite naivedhyams such as paal payasam, ghee and butter. However we must be aware how this milk is obtained in this Kali yugam, especially where milk is obtained in commerical farming techniques (as in big cities in India and especially here in the US). Before this exploitative factory farming age, our saints used to procure Milk products in harmony and without cruelty, the milk was taken from the cow only after the calf has had it’s fill and the cow was worshipped as Go-matha. Such offerings are certainly pleasing to the Lord. However in the present age, factory produced milk is a very cruel exploitative product of torturing cattle. The poor cows are enclosed in a tiny space, chained in its own waste in darkness, cold and filth for the rest of its life. It is pumped with insane amounts of hormones, and other toxic medications to artifically increase milk production. These large amounts of hormones, antibiotics and other unnatural feed, cause the cow to grow large and make it prone to bone fractures and other very painful diseases. To add to this torture the cows are artifically inseminated to produce calves to ensure regular supply of milk. The most unfortunate of the calves are male calves (called Bobby calves) who are considered to be useless and are sold off to be butchered for meat when they are just five days old. The mother cows separated from their calves cry in agony, yet they are not spared and are administered more hormones to continue milking them. After milking the cow till it has been exhausted and after ensuring that the cow cannot yield anymore milk, it is sold off to be slaughtered in the most brutal manner for meat and leather. I request all bhaktas to please think about this, will our Lord ever accept our abhiseghams and Naivedhyams if it means that His favourite innocent animals are killed slowly and extremely painfully all their lives? Let us not act in an adharmic manner and perform unthinkable atrocities and sins by offering factory produced milk and milk based products especially in our sacred rituals and also in our diets. I can only be certain that we shall never suceed in our sadhana if it causes so much needless pain for innocent animals. Lord Sri Krishna, vividly describes the three types of foods, Sattvic, Rajasic and Tamasic. Milk in the olden days was definitely Sattvic however now it is 100% Tamasic due to the abundant violence and abuse it entails. Drinking such milk is equal to eating beef. In fact the animals raised for meat do not have to suffer so much as these unfortunate dairy cows are made to suffer. His post prompted me to respond to him and to also go online to view some of the websites which I knew would show me the truth, as painful as it might be to watch and to listen. I am now convinced that I must be even more vigilant in my avoidance of all dairy products where I do not know the source. I will also post several more blog entries examining this subject in more detail, in the hope that each of us can look more honestly into our hearts about what we put into our mouths and onto our bodies, and onto the Lord. The Luthar.com blog already has several articles on the subject of vegetarian diet…this short series is specifically examining the vegan diet. We will look at ahimsa as the foundation for a vegan diet, the economic incentives fueling the abuse, the ways in which the dairy cows are abused, including their offspring, and how they are slaughtered in the end. We will examine the human health consequences of ingestion of dairy products and the environmental effects of the mass procreation of cows for human consumption. We will explore the organic industry as well. We will post photos and links to videos so you can see for yourself what is happening to the dairy cows. We will also post links to organizations geared to helping the abused cows and offering alternatives to the current system. We will offer suggestions and ideas on how to substitute other products in our diet and in our worship. We ask that you the reader examine the facts with an open heart. Together with Kamleshji, who has studied the subject extensively and speaks with eloquence and fortitude in His devotion to the Lord on this subject, I will continue to post, seeking His blessings and inspiration. 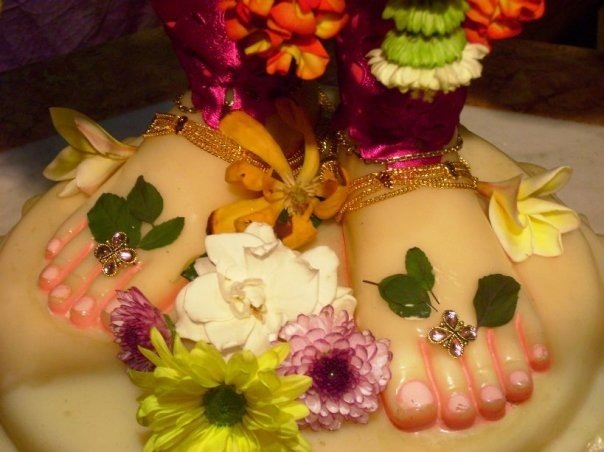 Today is Ganesh Chaturthi and I take this opportunity to post the first in this series on this day with this prayer…that I serve the Lord without reservation acting as best I can on His wishes, and that I open my mind and my heart enough to let Him speak through me as He guides me. Ganesha Saranam! Excellent articles, Radhe. Many thanks for publishing them. I have long had trouble reconciling the professed non-violence of most religions with the barbarity that lies behind milk production. It might be said that there is a certain hypocrisy in vegetarianism. A meat-eater is someone who doesn’t care about compassion, pure and simple. He doesn’t pretend to care and his position is plain. But a vegetarian can labour under the illusion that his actions are non-harmful because he is not eating flesh, whereas the truth is that his consumption of dairy products is causing the deaths and suffering of millions of cows. Your words are very wise and I hope they open peoples’ eyes. If only a few people stop to consider what lies behind the milk/cheese/butter they consume you will have provided a good service for the innocent animals and for humanity generally. Thank you for your kind words and I will pass this along to Shri Kamleshji. My service is to the Lord…what I write is in His hands and the outcome of what I write is in His hands.